This year our Christmas displays will run during December (1st-28th) from 8:30pm to 10:00pm. They’re spread over the church itself, and throughout Tea Tree Gully. We’ve created these to celebrate Jesus with our neighbours, so please come and enjoy! Every night our stable is showing four short movies celebrating the birth and life of Jesus. They show God’s purpose in sending Jesus to live with us, love us, and ultimately die for us. We were all lost in darkness and captive to sin. 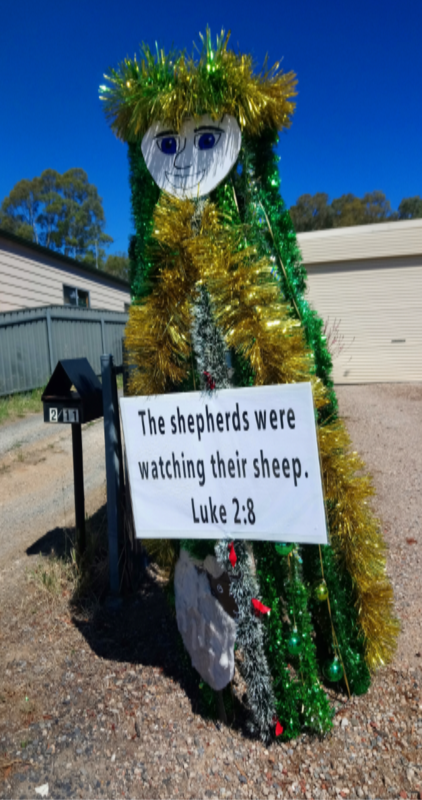 But, God had a plan called Christmas. He would send His Son, our Saviour, into the world. Created by two of our church members, this movie tells the story of God’s plan for our salvation. Also available as a free colouring book. 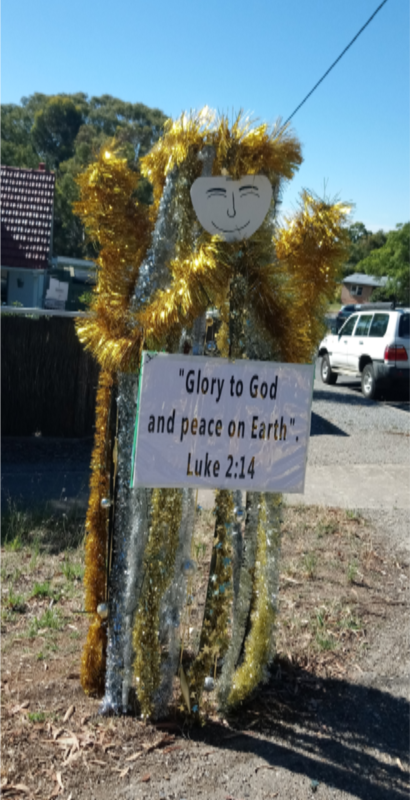 This Christmas, celebrate the birth of our King! Jesus came as a babe in a manger. Born in the most humble of circumstances. 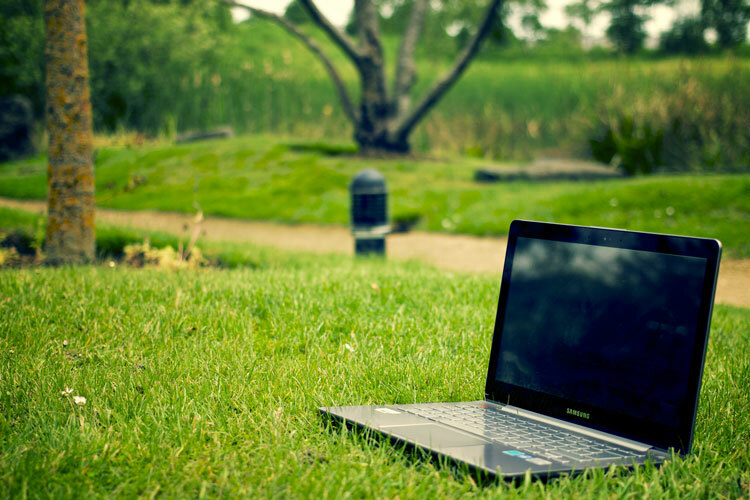 The Word made flesh to dwell among us. Immanuel… God with us! Tells the story of God’s plan of saving the world He had created by sending His son as a baby, to grow to a man who gave his life for us and then was resurrected from the dead to continue to love us. Surrounding the stable, we have nine images that light up in sequence to tell the story of Jesus’ birth. The whole garden lights up to represent Jesus’ journey from the stable to the cross. There’s also free books for both adults and children. 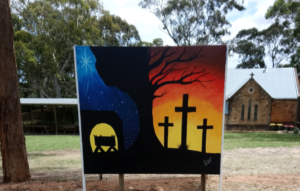 At the back of the church, we’ve placed a painting by one of our members. It shows the reason for Jesus’ birth, and celebrates Jesus’ victory over sin and death. You can see this painting from the walking trail around Anstey’s Hill. 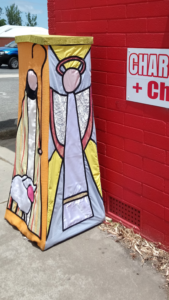 This year, our neighbours along Perseverance Road are hosting angels, wise men, shepherds and Mary with Jesus. 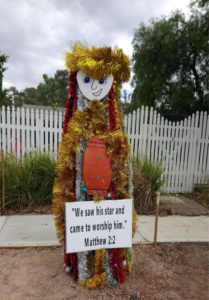 Each figure contains a part of the Bible that tells the story of the real people who has some part in the birth of Jesus. 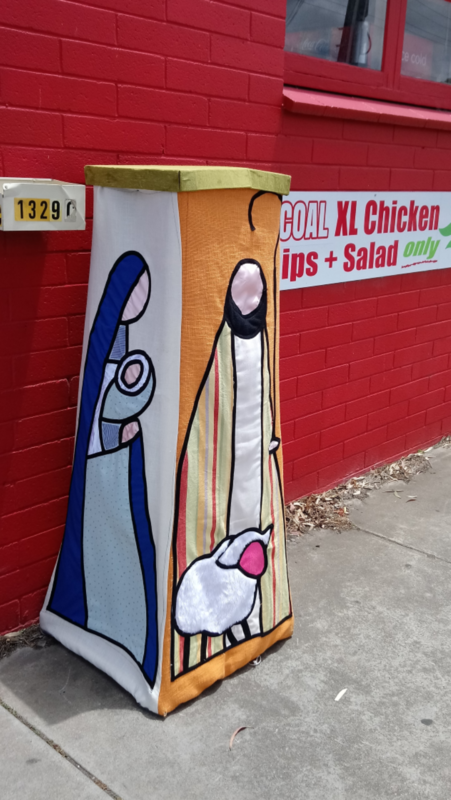 Our friends at the Tea Tree Gully Coffee Shop, Books in Clover and Tea Tree Gully Charcoal Chicken have joined in our celebration of the birth of Jesus. 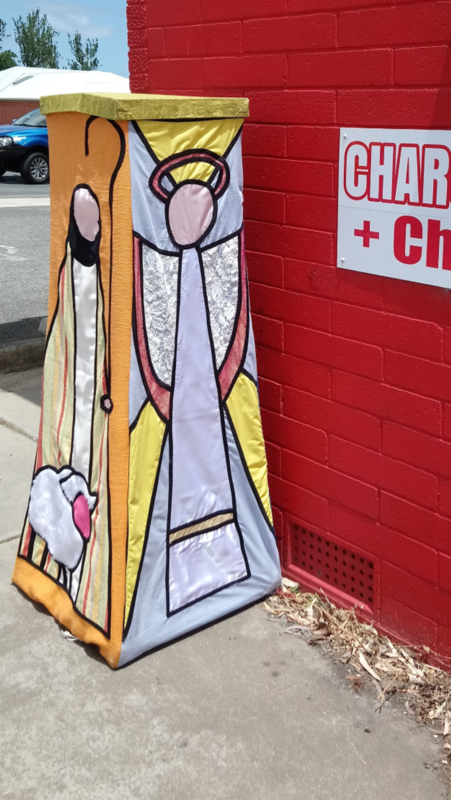 Each is displaying a large Christmas decoration outside their business. 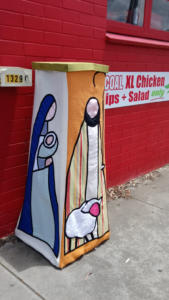 They’ve been made by our church, and each panel represents a different member of the Nativity; a shepherd, and angel, a wise man, and Mary with Jesus. Matthew 26:1-30 – Why Did Jesus Die?